When stump grinding won't work, or isn't the best option, we can remove the tree stump entirely from the ground. Our stump removal service is for those situations when a property required the stump and root system completely eliminated. As an example, an ash tree has a shallow root network, with roots running along the ground visibility making mowing the lawn and other recreational usages awkward, if not dangerous. 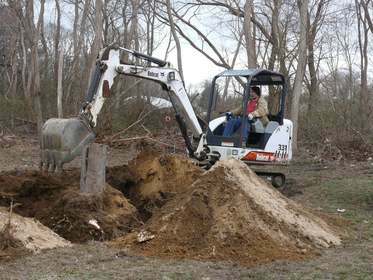 In these situations, stump removal is often necessary or at least desired. Removing a stump and the roots requires the use of a medium sized equipment, such as tracked backhoe. This is not a project for your average homeowner. The process requires digging out the stump and all large attached roots and returning the area to groomed condition, which often means some quantity of clean backfill. There will be nearby damage to surrounding areas and landscaping depending on the location of the tree stump to these areas. However, Timberlake's Tree Service Chesapeake takes the time to minimized or eliminated these impacts. Rake the ground and area around the removed stump to a condition ready for new sod, seed, or other landscape plantings. We provide free quotes on stump removals and offer multi-stump special if you have several tree stumps you wished removed. We guarantee all of our stump removal services until completely satisfied with our work. The complete stump removal job can take one to two hours depending on the age, size, tree species, and root structure. Call us when you want a tree stump completely removed.